Steven Fromholz is a natural storyteller, writing country-folk rock tunes boisterous and tender enough so that everyone from Willie Nelson to John Denver have recorded them. 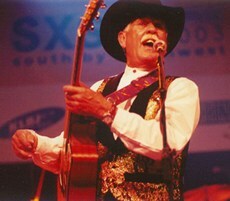 Willie's recording of Fromholz's I'd Have To Be Crazy earned him two platinum records and went to No. 2 in the nation. Fromholz began his recording career in 1969 in New York in the duet FRUMMOX. In 1971, Fromholz put out two albums on Capitol, one on Willie's label, Lone Star Records, The Old Fart In The Mirror on Jerry Jeff Walker's Tried & True label and six on his own label, Felicity Records. Lyle Lovett recorded Fromholz's Bears and Texas Trilogy on his Step Inside This House CD honoring Texas songwriters he admired. Steven shifted gears in 1977, trying out his acting talents. He has done theater and appeared in five motion pictures, including the psycho-drama thriller, Positive ID. In 1980, Fromholz accepted the job as entertainer on a series of river trips down the Rio Grande, eventually becoming a white-water river guide. On his own label, A Guest In Your Heart came out in 2001, with fellow musicians Lyle Lovett, Johnny Gimble and others, adding a special touch. The same year was the live album, Live At Anderson Fair. Fromholz describes his own music as "free-form, science fiction, gospel-gum, bluegrass opera, cowjazz music," a perfect formula culminated in his latest album, Cowjazz! Fromholz has two grown daughters, Darcie and Felicity and lives in Sugar Land, Texas with his wife Jenny.